Okay – let's be honest. We're all a little leery about the idea of making a pasta sauce with pumpkin puree, right? It just seems like a weird paring with pasta. Today, however, I hope to quell your apprehensions because this sauce has become one of my new favorites. There are so many layers of great flavors. 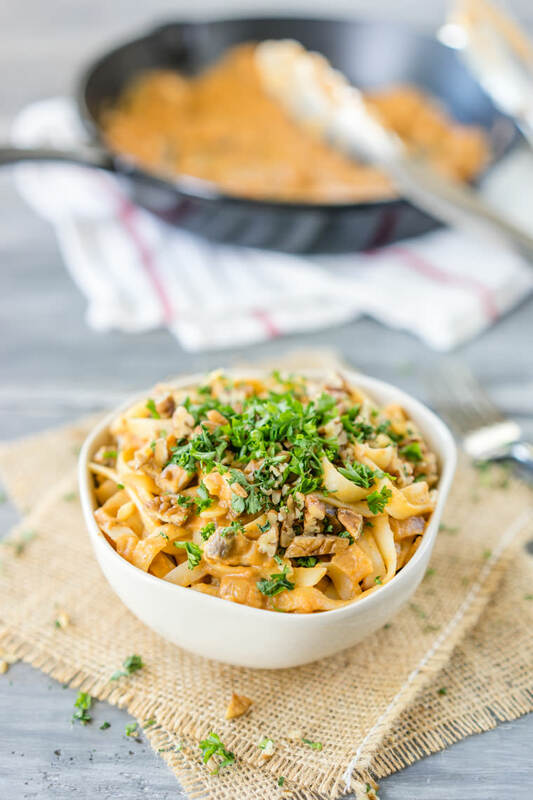 First, there's the Alfredo-like creaminess that comes from tahini, boosted with the umami of caramelized mushrooms and onions, all balanced beautifully by the brightness of the tomato and pumpkin purees. 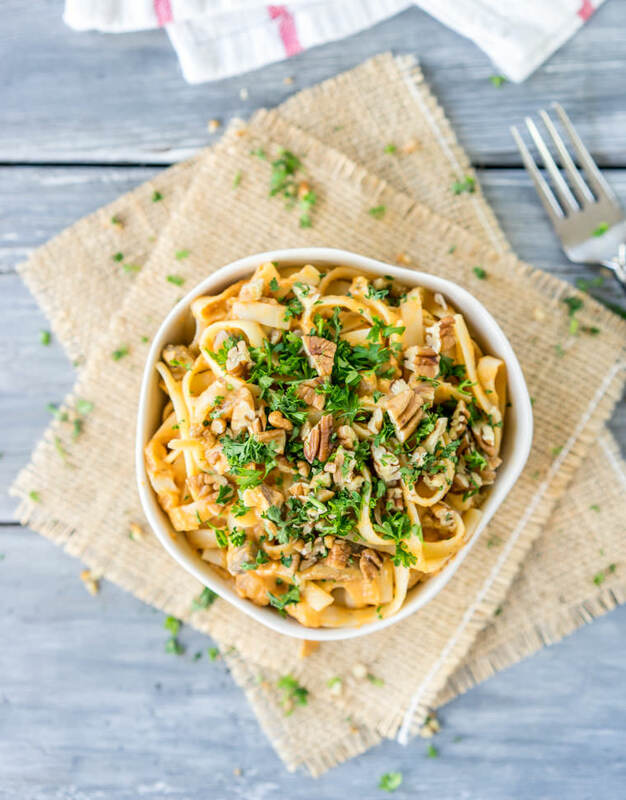 Toss with fettuccine, then garnish everything liberally with some fresh parsley and toasted pecans – in addition to being incredibly easy to make, this sauce is rich, decadent, and seriously delicious. Mince the garlic and finely chop about 2 cups of mushrooms along with a yellow onion. Add these to a large skillet heated with a tablespoon of olive oil and a splash of water. Sauté over medium heat until the mushrooms reduce and the onions turn translucent — about 8 minutes. At this point add in 2 tablespoons of soy sauce and a tablespoon of dried oregano directly onto these ingredients and give this 1-2 minutes to simmer. 1) Give it AT LEAST 30 minutes to simmer, preferably 45 minutes. The tomatoes need to cook off their acidity and the flavors need to meld together. 2) It will definitely thicken as it cooks, and you'll want to add water liberally to maintain the pasta sauce consistency – if it begins to resemble an orange-colored gravy, add more water (and don't forget to stir regularly)! Somewhere around the 30-minute mark, start cooking some pasta. You *could* use thin pasta like spaghetti but the general rule is that cream sauces such as this one do better with with wide, flat pasta because they hold the sauce better. When the pasta is cooked according to package instructions, simply drain and then transfer right into the skillet, using tongs to gently coat the pasta with the sauce. Garnish with some fresh chopped parsley and chopped toasted pecans. Seriously, this makes all the difference and takes the pasta to another level. You can either choose to garnish the entire pan or each individual bowl, then dig in and enjoy! Given the nature of pasta, it's best to serve immediately. However, the sauce itself can definitely be made ahead of time and will only get better after a day of refrigerating.